If you play a lot of baritone you may eventually find yourself cursing the weight of the horn. Whether it is a low-Bb or low-A horn the weight is still something you are reminded of every time you hang the horn from your neck. For some the weight can cause stooping or improper posture of back aches. I’ve even heard it questioned as to whether kids in middle-school should be allowed to play the hefty beast for fear of affecting their rapidly growing bodies. After playing nearly all of the commercially available harnesses I’ve finally spent the big bucks and decided to try a semi-rigid option. First lets start with the materials. This harness is a combination or 4 different materials: plastic, leather(? ), silicone, foam, and nylon. The rear support sliders are a strong and flxible plastic. At the base of the support the nylon webbing waist strap is attached. The shoulder hooks, at the top of the back support sliders, are made of jointed plastic with firm foam to cushion the shoulders. From the hooks a nylon cord runs through a plastic “V” to the hook which attaches to the horn. A short elastic string is included that attaches the hook to waist belt to keep the hook from moving out of position when you unhook your horn. The build quality of this strap is fantastic. It is the quality you may have come to expect from Vandoren products. The monochrome black finish is perfect for disappearing into clothing.The horn hook is the twisty wire type and works well. The size I purchased has a waist band that is adjustable and should fit wastes down to child size and up to a 34″ but with the included extension you can fit up to a 38″ waist. 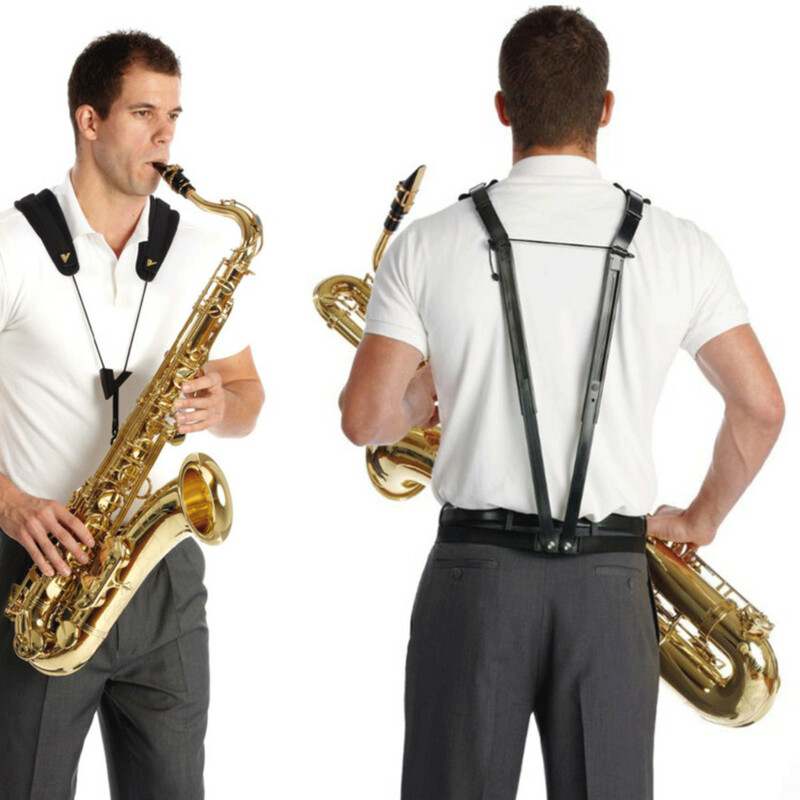 The harness comes in handy neoprene bag and should fit in the bell of most tenor and baritone saxophones. This piece of hardware is well thought out and the finish is excellent. There are no sharp edges, misaligned joints or loose hinges. For the expense you should expect nothing less and they delivered. Once you are attached and playing you adjust with the large “V” shaped adjuster. The Adjuster is asymmetrical, theoretically to keep alignment when a player play the horn while seated. Because they styled the adjuster after themselves some people may not like it. If it works for you then it’s a magical experience of near zero gravity baritone saxophone playing. This thing takes time to hook up. Prior to this i used Neotech harnesses and straps and they were 10 seconds on and 10 seconds off. Very simple even if not as robust as this bit sax kit as Neotech’s tend to stretch over time. Next issues is that it is sometimes hard to slide the “V” adjuster up and down the chords. The friction is good but sometimes it’s a bit too much. The shoulder hooks present the next issue. The front portion of the shoulder hooks are a neoprene like material with canvas webbing but the back half is hinged plastic with a dense foam rubber pad. Here the sides of the back half of the hook frequently dig into my shoulders. I have meaty shoulders so that might be part of the problem. The waste band also has an issue. If you wear a belt then the positioning the lower strap below your belt at waist level is easy and it will stay in position fairly well. If you don’t wear a belt then you might find the lower strap climbs up waist thus limiting the benefits of the device. This especially bad while seated. I tried threading the waist band through my trouser belt loops but that became uncomfortable as the back supports wanted to pull the rear of my pants open giving me a “plumber’s crack” and as you might expect the trombone players didn’t appreciate the view. Lastly, the expense of the thing is a con. I paid full retail at $150 for it and i I honestly think it’s more of a $80 premium piece. TAKE AWAY: Sadly I just couldn’t get it adjusted to fit my unique 2 arms, 1 head, and 1 waist anatomy. If possible go to a local shop and try it on before buying it.